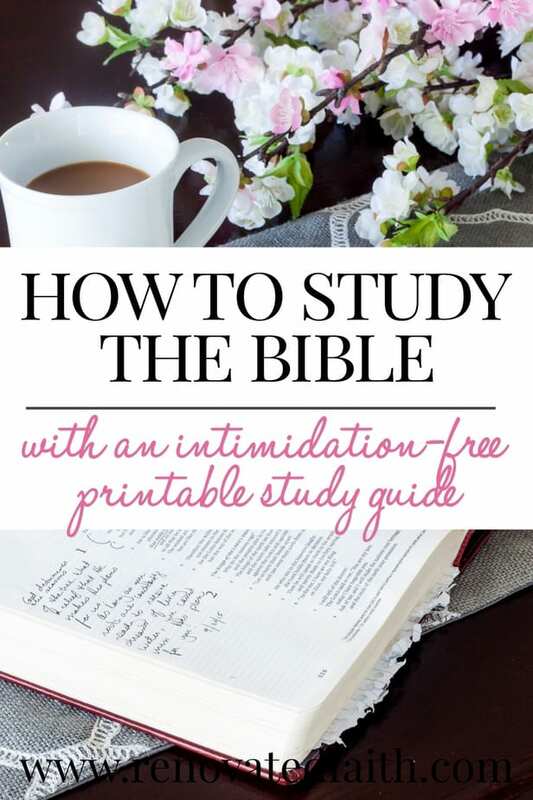 Don’t let intimidation prevent you from learning how to study the Bible in-depth! 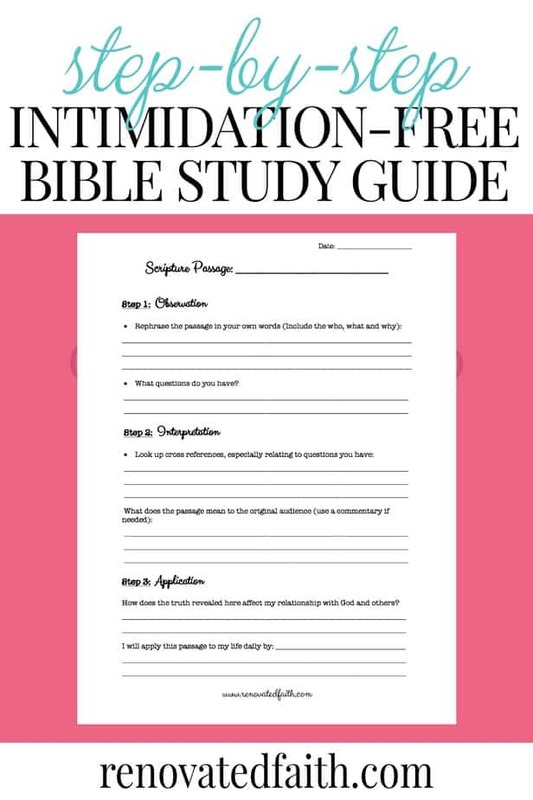 Just apply these simple steps with my free inductive bible study guide! 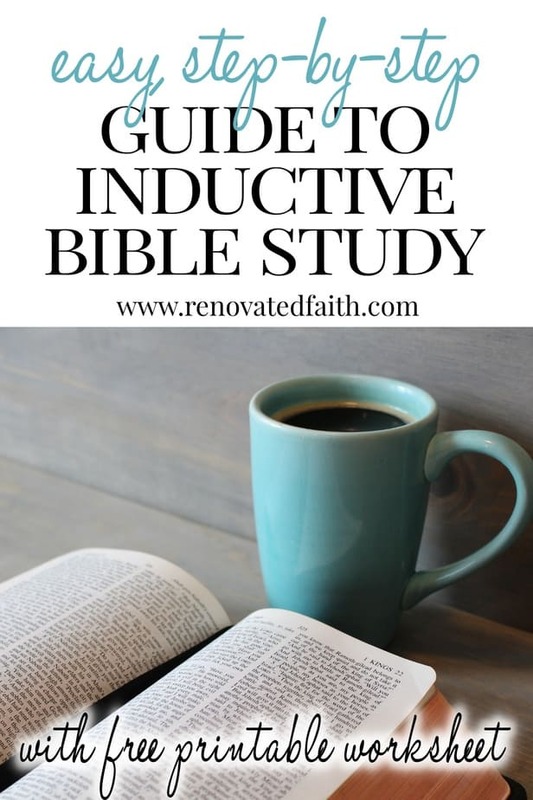 Maybe you are a new believer or maybe you have been in church all your life but don’t know how easy it is to dive into God’s Word with inductive Bible study methods. Here are some simple steps that are simple to follow in order to get the most out of your Bible study time, making it the richest part of your day! My favorite part of the day is the time I get to spend in God’s Word. As I sit with my Creator at our dining table with the sun streaming through the windows and a cup of coffee in my hand, I gain a greater understanding of my purpose and His plans for me as I study His Word. Before I started Renovated Faith, I worked at a church full-time and also graduated from seminary with my M.Div with biblical languages. In many of my posts, I share how God transforms our brokenness in the same way one can rehab an old piece of furniture. But I can’t begin to talk about how God renovates our lives without sharing about the importance of spending time studying His Word. The Bible is not just a book but is the personal revelation of Jesus Christ to His people. Through it we can receive hope, hear of His love for us, understand how to be more like Him and gain insight in making the best decisions in any aspect of life. The Bible isn’t just a history book or even a self-help book. The words within its pages are the inerrant and inspired words of God, and they are useful in every aspect of our lives (2 Timothy 3:16). Within the pages of Scripture is the key to radical transformation to be more like Christ. Studying God’s Word is the key to understanding His Will so our lives can be transformed, renewed and restored in light of those truths. No matter if you are a brand new believer or have been to church all your life, you can’t truly grow in your relationship with God if you don’t spend time in His Word. We all start out as babies in our relationship with God but we don’t want to just stop there. We need to continue to grow and mature in our walk with God so we can have greater spiritual insight to understand the “unsearchable riches of Christ”(Ephesians 3:8). Which Version of the Bible is Best for Bible Study? Should I Study the Bible Every Day? Where should I start in Bible Study? Does my Quiet Time Need to be First Thing in the Morning? What if I Don’t Understand Parts of Scripture? What if I Have No Knowledge of the Bible? The goal of Bible study is not just to gain greater knowledge but to apply the truths of the Bible to everyday life. The reason we study Scripture is so we can apply it. With every insight we learn from God’s Word, we should prayerfully consider how it should be applied in our own lives. Not allowing God’s Word to result in action is as unnatural as looking in a mirror and quickly forgetting what you look like according to James 1. So no matter where you are in your journey, set a daily appointment with God. Then commit to spend time every day studying the Word. Simply knowing how to read the Bible isn’t enough but it’s important to know how to study the Bible for yourself. Don’t get me wrong, reading God’s Word is important but in studying God’s Word, we dig deeper to understand the background of the passage, the meaning in it’s original context and then how we can apply it within the context of present-day. Maybe you are going through a trial and want to do a topical search on some aspect of Scripture. That’s a great idea and there are definitely times we need to study topically. But on a regular basis, I recommend going through small chunks of Scripture verse-by-verse so you can see God’s Word in context. Studying expositionaly (one verse at a time) prevents us from being tempted to pick out what topic we want to hear most as opposed to maybe what we need to hear. Find a quiet place that’s comfortable where you will be less likely to be distracted. For me, it’s my dining room by the window. Keep the following items in that location so they are ready every day. Most importantly, put your phone in another room so you aren’t tempted to check it! A Daily Appointment– Set aside a regular time each day. You will be amazed how everything else will clamor for your time but the most important time of your day is your time spent with Him. You wouldn’t miss a coffee date with a friend so don’t miss this appointment with your Heavenly Father. Concordance (Optional) – Some Bibles don’t include one. 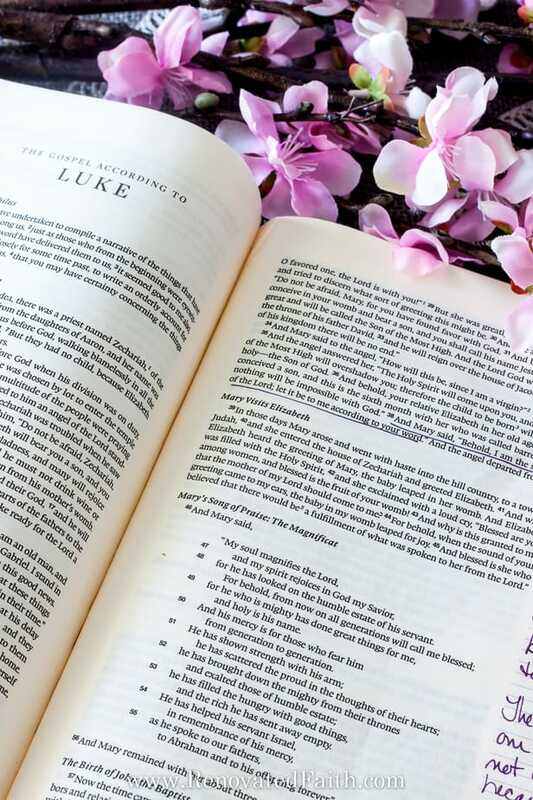 Make a Bible Study Notebook with your printables. Click HERE for feminine binder options. Bible study versions fall into two different types. There are formal equivalencies (ESV, NASB) and informal equivalencies (NIV, HCSB). Formal equivalences do the best job they can to keep word order close to the original Greek or Hebrew. Informal equivalencies put a higher priority on what sounds more natural. So, while formal equivalencies sound a tad awkward at times, they are better for Bible study for the formal equivalencies because they hold closer to the original language. I highly recommend the ESV because it holds closely to the original version but is very natural sounding. Before you get started, keep in mind that there is no ONE right way to do Bible study. Therefore, don’t feel defeated if you have a busy day and don’t get through the steps I have listed below. God is most concerned about your relationship with Him and just wants to spend time with you. He understands that you are busy and is fully aware of what season of life you are in. Even if your time with God is a hot mess, He will honor your efforts and desire to know Him better. I came to know Christ at a young age and soon after praying to receive Christ, I attended a discipleship class for kids. The focus was to learn the importance of spending time with God. We got our summer Bible study books that walked us through little devotionals for each day. An older couple taught the class and during the first meeting they told us to pick when we would do our Bible study time and come ready to share next week what we each picked. She meant was that we should pick the time of day we were going to do our Bible study but I misunderstood and thought she meant to pick which day of the week we would do our Bible study. I spent all week trying to decide the perfect day to do my quiet time. After much scrutiny, I decided Thursday would be the perfect day! When I shared this with the Bible study leaders the next class time, their eyes got a little big and they smiled as they explained that I was supposed to pick what time of day and not just which day of the week. First of all, my insistence on finding the “perfect day” caused me to procrastinate. Don’t allow your focus to be on studying the Bible perfectly or you may find yourself putting it off. Instead, focus on your relationship with Him and knowing Him better instead of following steps. The steps are just a tool and the focus is God. At the time, that seemed overwhelming and it still can be at times. But honestly, the days that I seem to have a greater joy, peace and connection to my purpose are the days I have spent time with God. I feel most “at home” when I am in God’s Word and although my trials might not change I have greater peace in the midst of them because Scripture reminds me of where my hope lies. 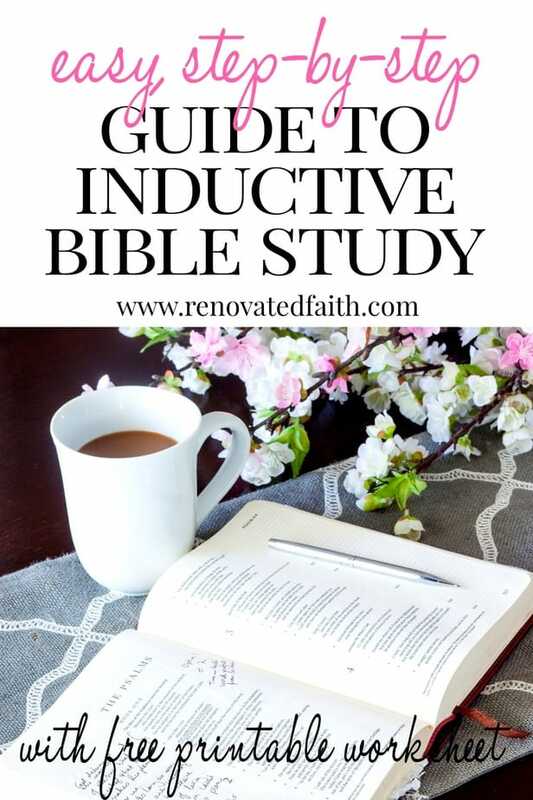 One of the most effective ways to grow in your understanding of God’s Word is through “inductive” Bible study. Observation: What does Scripture say? Interpretation: What does Scripture mean? 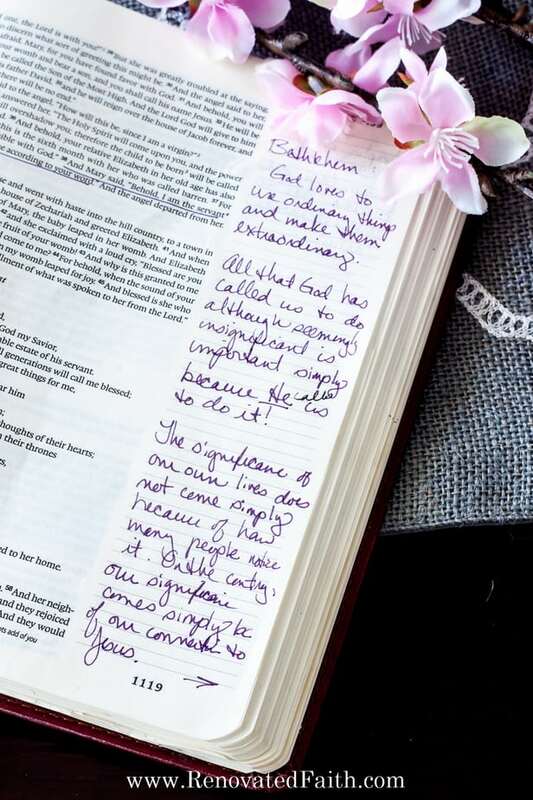 Application: How does Scripture apply to my life? Here is a video that explains the whole process and samples of how to apply these steps can be seen below using Psalm 46. Authorship – Who wrote the book ? Some suspect that King Hezekiah wrote this psalm after God’s deliverance from Sennacherib according to Dr. Constable’s Commentary. Why was the book written? The Psalms are the inspired responses of human hearts to God’s Word. It is a collection of prayers and praises. The song praises God for being a refuge for His people and expresses trust in Him. Date Written: Unknown for this particular psalm but the book as a whole was written during a span of 1400 – 400 B.C. The observation step starts with reading through the passage for basic understanding. For this step, you are looking at what the verse has to say at face value. Paraphrase the passage in a way that makes sense to you. Just put the passage in your own words. Ask the questions who, what and why and record your answers. Take note of any questions you have and you WILL have questions. I do all the time and I’ve found that the most confusing parts of Scripture are often where I get the MOST out of Scripture upon finding the answer. Take note of any repetition or cause and effect words (For Example: And, But, If/Then, Therefore). Take note of any other observations. Who: God and His people What: the river, mountains, the sea, kingdoms Why: God protects us because He loves us. Questions I Had: Who is the river in this passage? Is he referring to the river when the author says “her”? Words to Take Note of: “Therefore” in verse 2. It is interesting that in verse 10 the writer uses “says” in the present tense. Interpretation is discovering the actual meaning of a passage and what the author was trying to convey. During this part we will try to answer any questions that arise from our observations. Cross References – Let Scripture interpret Scripture. In other words, when you are unsure about a verse, let other passages in the Bible shed light on the passage you are looking at. Scripture will never disagree with Scripture so we can use other parts of God’s Word to refine our understanding. Commentary – After you have spent some time looking at cross references to answer your questions, you can look at a commentary. Commentaries aren’t meant to replace our study of Scripture but to enhance it with background information and grammatical insights. Perhaps my favorite commentary is one that is free online called Dr. Constable’s Expository Bible Study Notes. Dr. Constable’s Notes, authored by Dr. Thomas L. Constable, provide commentary on all 66 books of the Bible and contain over 12,000 pages of material in PDF format. Dr. Constable taught at Dallas Theological Seminary for 45 years, and served as the Chairman of its Bible Exposition department for 13 years. He now spends most of his time upgrading these notes. They are a wealth of information and he makes them very easy to understand and apply. 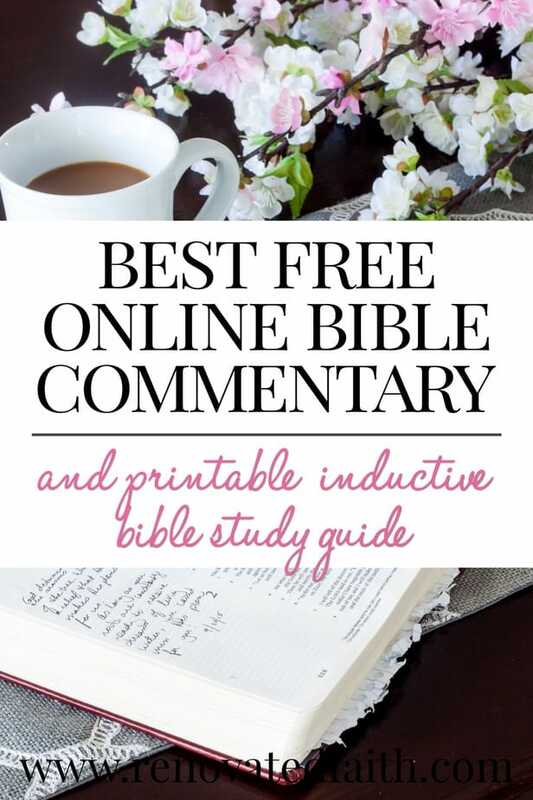 The NIV Application Commentary – These are excellent and great for beginners in Bible Study but I also know many pastors that use them. New American Commentary – These are a little more exegetical and technical. Check cross references to see what other passages tell you about this passage: I questioned who the river symbolized. When I looked at the cross reference for verse 5, it told me to look at Isaiah 12:6 which refers to God working among the people of Jerusalem. Therefore, I can conclude that the river is God and “she” is Jerusalem. • Sennacherib’s demands become increasingly less direct, moving from military threats to just correspondence. • You can also see how Hezekiah’s responses become increasingly based upon trust as he moves from acquiescing to the threats and paying the tribute, to refusal and seeking the counsel of Isaiah, and ultimately to a complete trust in God’s saving ability as expressed in his magnificent prayer. • The reference to this battle gives greater illustrate Hezekiah’s gradual growth of trust in God and to justify its earlier evaluation, “He trusted in the LORD the God of Israel; so that there was no one like him among all the kings of Judah after him, or among those who were before him” (18:5). The Assyrian army is supernaturally defeated at night, forcing Sennacherib to return to Assyria where he is murdered by his own sons. It also mentioned that God’s presence in Jerusalem was similar to that of a peaceful, life-giving river rather than a raging sea. Old Jerusalem had no actual river but because God abode in the city, it experience safety and security in Him. This is the most important aspect of Bible study because we have to apply the truths we learn to our everyday lives. The purpose of our study is application which leads to transformation so we can be more like Christ. Without application, we are merely storing up knowledge. How does the truth revealed here affect my relationship with God? How does this truth affect my relationship with others? The application step is just a matter of answering these questions but the key is to put God’s Word into practice. God doesn’t expect us to be perfect but we are to seek to apply God’s Word in our lives, relying on Him for strength and guidance. When you seek to apply God’s truth to your life, God will be faithful to bless your efforts by transforming you to be more like Christ. When you are done with your Bible study time, be sure to pray for His help in walking out His truth. How does the truth revealed here affect my relationship with God and others? Although life can be full of chaos and hardships, we can rest in knowing that we can safe and secure because God is in us like a peaceful river in the heart of Jerusalem. He might not calm the situation, but we can experience true peace even in the midst of disorder. Our role is to trust Him and respond to the sound of His voice. Verse 10 is in present tense meaning that today, God tells us to be still and know that He is God.” The term “be still” actually means to “cease striving” which as I mentioned in my Scroll post is a great mental picture of how I often struggle to solve my own problems instead of allowing the very Creator of the Universe to deliver me. One thing the commentary mentioned was that it took Jerusalem a couple years to rebuild but afterward they experienced a magnificent harvest. It made me think about how God’s trials might require a waiting period but we can be sure that HE WILL deliver and preserve His people. This is a fabulous Psalm to read where your world seems to be falling apart. I will apply this passage to my daily life by: realizing that although my life might seem like it is full of chaos, I can be still in the midst of it because God resides in me like the calm river among Jerusalem. There may be a wait involved but God WILL deliver me from whatever comes my way. I can remember “this too shall pass” and He will have victory, restoring me as only He can. 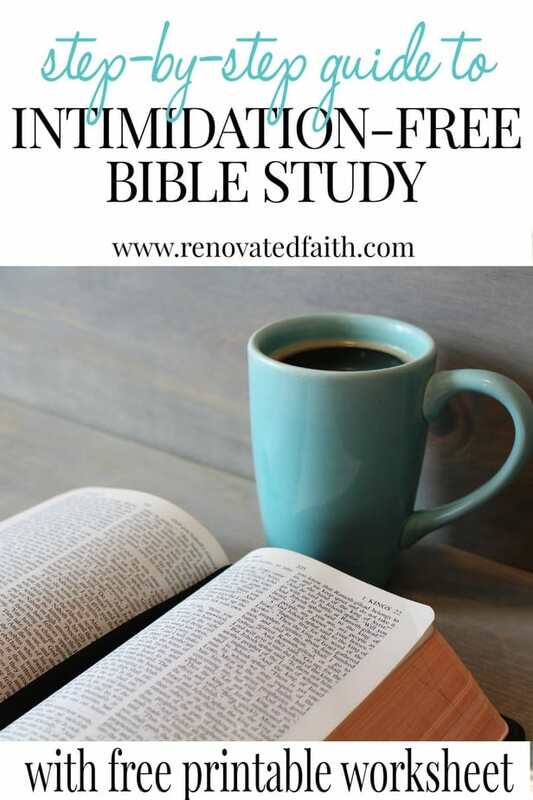 To help you with your Bible study time, I’ve created a free inductive bible study PDF download where you can simply follow the steps and answer the questions I mentioned above. If you are already a subscriber, click here for the library of free printables and use the password at the end of your last weekly newsletter. Before studying Psalm 46, I had heard the passage several times before but had never known about the background of Hezekiah in 2 Kings. That was all just from the online commentary resources I linked to above. I say that to show you that you don’t need to be a Bible scholar to study the Bible. All the information is right at your fingertips so don’t get overwhelmed! Also, don’t cover too much at a time. I would recommend going through the inductive Bible study steps with only 6 to 8 verses at once. There is where studying is very different than reading. Your priority should be quality, not quantity! You can start anywhere in the Bible but I would recommend starting with a shorter book like 1 Thessalonians, Philippians, Colossians or 1 and 2 Timothy. James is one of my favorite books so that’s also a great place to begin. You might also like to try the Gospels first : Matthew, Mark, Luke and John. I chose an Old Testament passage as a sample for our inductive Bible study to show you how easy it is to get background information from commentaries. Context is Key – When you don’t understand a verse, read the context. The paragraph, chapter and book will give you lots of clues to the meaning. If we imply a meaning to a verse, that isn’t really there we misunderstand the meaning of the passage and it’s misapplication can be harmful to us and others. God takes very seriously the correct interpretation of His Word and we should too! Don’t Compare Your Walk with Others – Your spiritual journey does not consist of rungs on a ladder. If someone is studying more than you are, that’s fine. But you aren’t them. Don’t let someone else’s relationship with God in any way deter you from spending time with Him. Be Doers of the Word – If we are hearers of the word and not doers of the word, James 1 tells us that we deceive ourselves. Don’t be like the Pharisees who didn’t apply God’s Word or applied it incorrectly. Focus on God and not just attaining knowledge for your own purposes. Scripture doesn’t give any instructions on WHEN our study time with God should be. It just says we should regularly spend time in the Word. I would recommend setting a time each day so you can make Bible study a regular appointment in your schedule but the time of day is completely up to you. There WILL be parts of Scripture you don’t understand. Welcome to the club! Fortunately, the most confusing parts of Scripture have been the places in God’s Word that I have found to be most rewarding. Sometimes it’s when Scripture seems to contradict itself is when we dig further to discover the gem of God’s truth that is hidden there. That’s absolutely fine! God is absolutely thrilled that you want to spend time studying His Word. You can get Bible tabs (like these) to help you find your way in God’s Word. Don’t forget that there is a table of contents with page numbers. Although I have been to seminary, I was not at all familiar with the story of Hezekiah’s victory over the Assyrians in 2 Kings. So, what you don’t know you can find with your cross references and with commentaries. Don’t let fear get in the way of the most transformational time in your day. God’s Word has the power to help us heal, fix our brokenness and to grow in our walk with Him. Only through it can we better understand how to live our lives and make wise decisions. What an amazing blessing to have God’s Words in written form to access any second of the day! 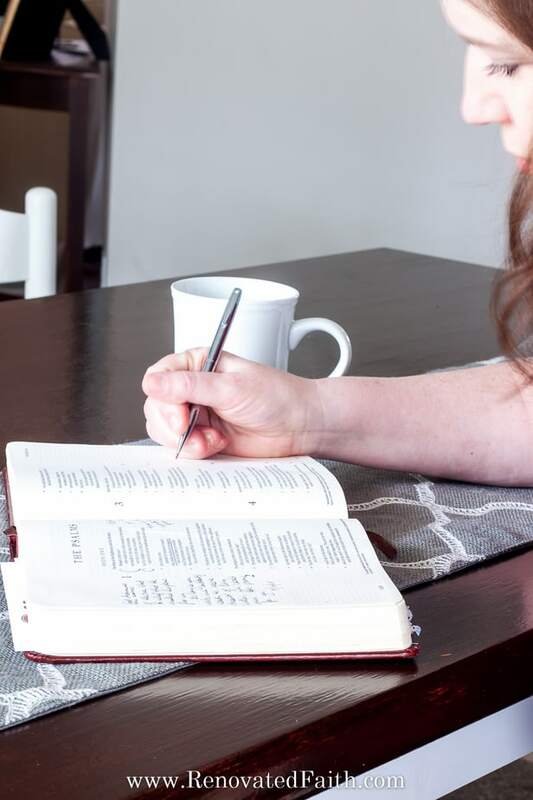 Hopefully, with these tips and easy steps, you can feel more at ease in making Bible study part of your daily routine. 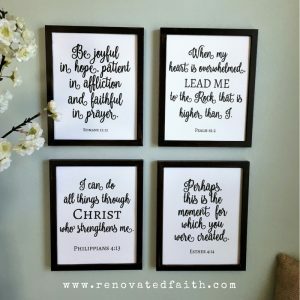 Now, get a cup of coffee, your Bible and your free printable, and enjoy some time with Him! How do I print the printable downloads without downloading the pdf software contained in your posts? I do not want that downloaded on my computer because I already have Adobe. Thanks so much and have a blessed day. You know what that is??? Those are ads that pop up that have nothing to do with my post. Just click on the links where I say Click here and not on any buttons. Sorry about that. I wish those wouldn’t pop up.